​Objective: To provide an opportunity for whole families to spend an extended amount of time on the land practicing a healthy, traditional lifestyle. Description: Edehzheh (Willow Lake Camp) is an initiative of the Deh Gáh School in Fort Providence. Under the guidance of principal Lois Phillip, the school has prioritized land, language, and culture. Edehzheh bring these three things together in the form of a month-long language and culture immersion program for community members of all ages from small children to Elders. 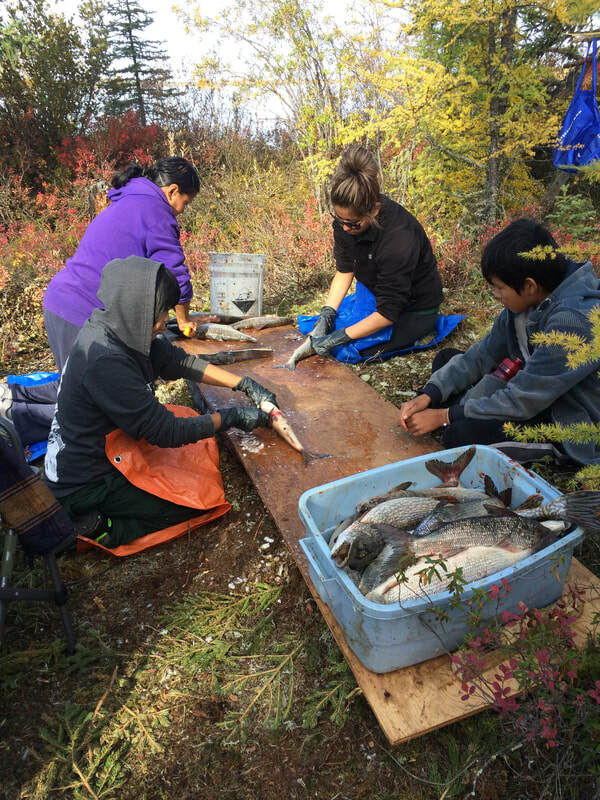 In addition to developing their language skills, participants at the camp hauled wood and water, set nets and cleaned fish, made dry fish, gathered medicines, caught and skinned beaver, and harvested berries. Successes: Camp leaders observed positive changes in all of the participants. Youth, in particular, seemed more grounded and willing to help. They were proud of the skills they gained. It took time for the participants to settle into the rhythm of the camp and to detoxify their bodies (the camp was drug, alcohol, and sugar free), suggesting a shorter experience would not have had the same degree of effect. Beyond learning the language and traditional skills, the camp was an opportunity for younger participants to learn about their history, including the devastating impacts of residential schools. The organizers believe that this kind of programming is essential in healing their community. ​Objective: To teach youth how to safely harvest good wood and provide Elders in the community with wood to heat their homes. Description: During the winter months, many households in Inuvik heat their homes with a wood stove. Some Elders are unable to gather wood on their own. Through this program, the youth at East Three Secondary School ensured that Elders in their community had enough wood to keep their houses warm through the winter. Successes: Students in the Wood for Elders program took ownership of the process of providing local Elders with wood. They developed a step-by-step process for harvesting and distribution, acquired the necessary equipment, mapped out routes, and performed administrative work, such as acquiring licences and permits. The Wood for Elders program allowed students to spend time on the land with a purpose. It not only enhanced their cultural knowledge and skills, it also allowed them to give back to their community. In the process, students developed skills useful on the land, at home, and in their school/work lives. ​Objective: To encourage kids in the community to be active, enjoy the outdoors, and learn more about the environment. Description: Nature Club is a free after-school drop-in program in Hay River for children ages 10-13. It is jointly delivered by the Town of Hay River’s Recreation Department, the NWT Centennial Library, and Ecology North. This year, Nature Club met every other week for fun outdoor activities that included dogsledding, compass orienteering, snowshoeing, kayaking, and survival skills. ​Objective: To provide a safe on the land experience in which youth can explore their Dene or Métis identity, learn from Elders and knowledge holders, and develop their leadership skills. Description: Youth from across the Sahtú travelled to Dǝocha (Bennett Field) on the Sahtú Dǝ (Bear River) for a two-week winter land camp. This was the first camp of its kind sponsored by Ɂehdzo Got’ı̨nę Gots’ę́ Nákedı (Sahtú Renewable Resources Board). While at the camp, youth participants worked with Dene Elders and knowledge holders, learning how to gather wood, set nets and snares, sew, haul water, tan hides, travel by skidoo and snowshoe, and skin and prepare rabbits. They also participated in a painting workshop, completed gun safety training, and piloted the new NWT hunter education curriculum. A digital storytelling workshop at the end of the camp helped the youth to reflect on the meaning of Dene ts’ı̨lı̨ (being Dene). ​Successes: The camp gave youth participants the opportunity to work alongside and learn from Sahtú Elders and knowledge holders, as well as non-Indigenous instructors in a cross-cultural context. In addition to developing their on the land skills, the youth participants developed a greater awareness of the diverse histories, cultures, and forms of governance in the Sahtú. The camp provided youth participants with an opportunity to reflect on their identities and futures as Sahtú Dene and Métis. The camp was also an important learning experience for the organizers and instructors in the possibilities and challenges of delivering cross-cultural programming. Objective: To provide youth in treatment and their families with the opportunity to strengthen relationships and reconnect with traditional lifestyles and skills on the land. Description: Youth from Trailcross Treatment Centre in Fort Smith and their families spent five days on the land at a local trapline. 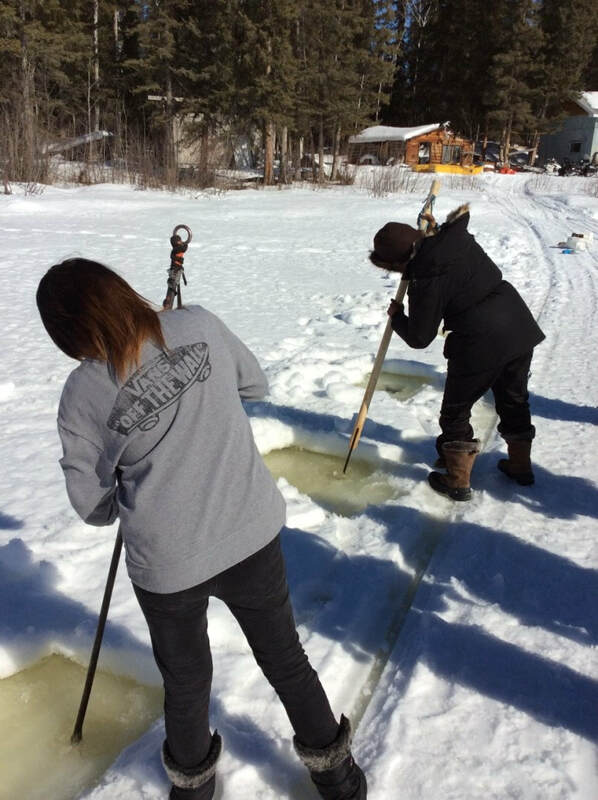 Guided by local Elders, the youth and their families learned traditional skills, such as setting fish nets, snares, and traps; skinning beavers and rabbits; filleting fish; and gathering medicine. The youth and their families also participated in daily sharing circles, which provided them with opportunities to learn about the histories of their families and their communities, including the impact of residential school. Successes: The camp allowed youth to explore their cultural heritage and learn in a traditional way: by doing, guided by Elders and knowledge holders. The youth demonstrated pride in their Indigenous heritage and a desire to learn more about it. They also felt a sense of accomplishment with their newfound skills and knowledge. The camp was equally powerful for some of the family members, including a grandmother, for whom the camp was the first time she had been in the bush since she was 13. The youth not only learned from the adults present, they also shared their knowledge with others at the camp. Through time spent on the land, the youth became a cohesive group that supported one another and assisted the Elders. Objective: To promote community inclusion and create opportunities for participants to connect with the land and their culture. Description: The mission of the Salvation Army’s Mental Health Support Services is to inspire clients to have maximum quality of life, independence, and a strong community engagement. They do this, in part, through recreation programming. Much of this programming takes place indoors. 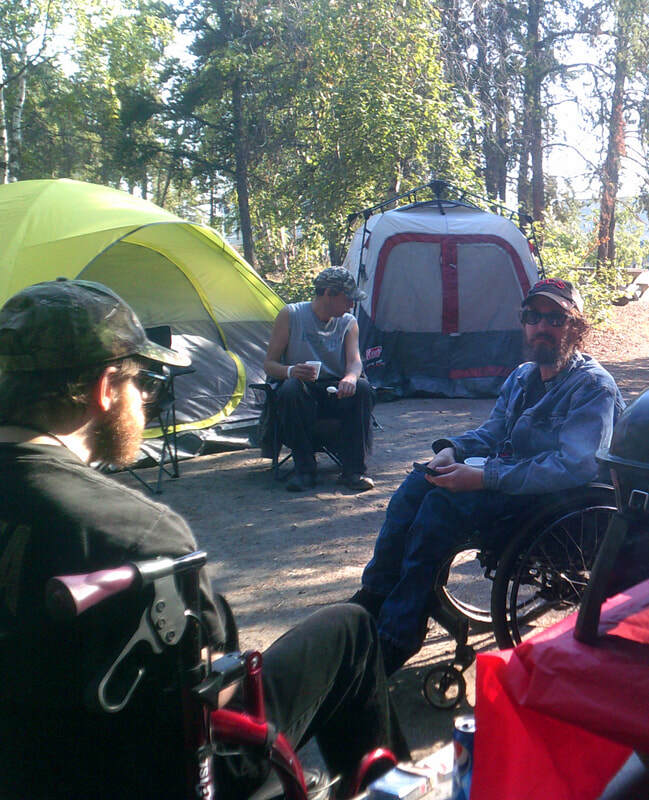 In 2016, support from the Collaborative allowed Mental Health Support Services to expand their recreation programming to include outdoor activities, such as fishing, hiking, gardening, dog sledding, and camping. Successes: The outdoor activities offered were very well attended and participants were enthusiastic and engaged, a significant success given that motivation is often a barrier to participation for people with chronic mental illness. Staff observed that participants were more relaxed and open during these activities, sharing childhood stories and information about their cultural backgrounds. In addition to building and strengthening relationships within and between staff and clients, the outdoor recreation program gave participants an opportunity to demonstrate skills and knowledge that others were not aware of, such as building fires and fishing. The garden, in particular, enabled participants to share the fruits of their labour with others at the Salvation Army, including shelter clients. Objective: To revive and maintain the network of traditional trails in the ancestral territories of the Tłı̨chǫ. Description: In August 2016, 18 people from the four Tłıchǫ communities travelled more than 500 kilometres by canoe from Behchokǫ̀ along the Mowhi Trail to the barrenlands and back to Wekweètì. In recent years, the traditional trail system has been infrequently used. Reviving the trails is about both physical and cultural maintenance. Over the course of three weeks, participants revitalized the trails by cutting down new growth and remarking portages. The trip also provided an opportunity for Elders to tell stories about the trails and the places passed on route to the other participants. Successes: The Mowhi Trail has seen very little travel in the last 70 years. Drawing on Elders’ memories and hand-drawn maps, the groups identified, marked, mapped, and recut more than 60 portages along the route. This was no small feat. Forest fires and lack of use made it extremely difficult to identify trails and camps. In addition to reviving the old trail, the trip provided an opportunity to document traditional knowledge about the trail and the cultural sites along the way. Reviving the language, knowledge, and oral traditions of the trail network in the collective memory of the Tłįchǫ is part of ensuring the future of the Tłįchǫ way of life. Participants also took pride in completing a long and technically difficult trip.